My brother bump into an accident this morning before noon and there was another accident happened at the same place near Tabuan Jaya. 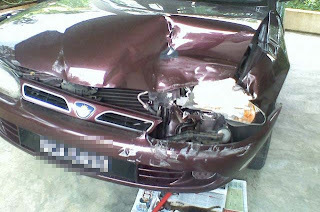 According to him, the front car had emergency break in front of traffic light when it turn to red so he hit after him. What more to say...my brother fault to hit on the back. 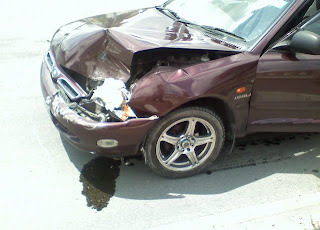 Luckily no major injury just the car...but the other fella only broken on the back bumper and of course we have to pay him for the repair fees. Aiyor...he must be going very fast to cause such serious damage! Pandu cermat, jiwa selamat!! !